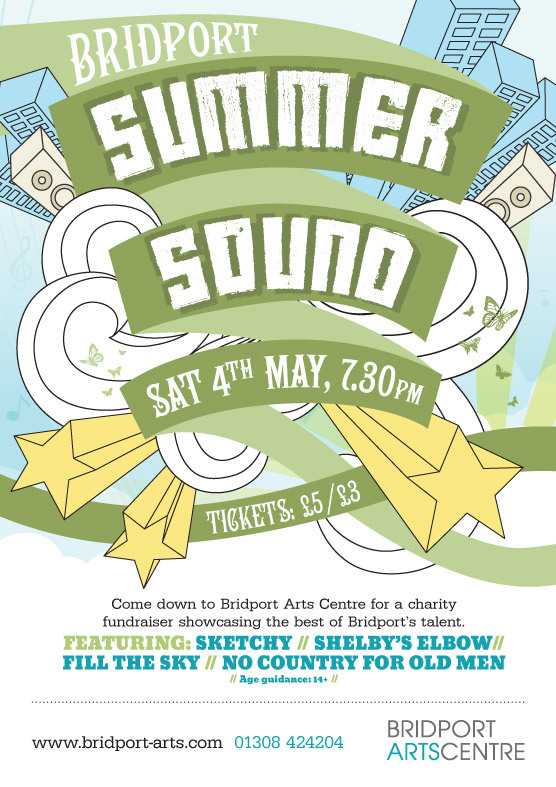 Another fantastic fundraising event is taking place at Bridport Art Centre on the 4th May 2013 called Summer Sound. As the centre’s design agency, CuCo was asked to design a striking creative to go across all marketing collateral, enticing the masses. What is really nice about this event is that it wasn’t thought of by the centre itself. Bridport Art Centre was actually approached by Ryan from No Country For Old Men offering to do a fundraising event for the centre as he wanted to play in his home town, where he actually started out. He also wanted to support BAC as they had been such an important place for him when he was at the start of his musical career. As the news spread, other bands came on board making Summer Sound a great way to kickstart the summer for the centre. Bridport Art Centre has always aimed to support emerging talent and in return the community have always been eager to help. Even when they have left and found their feet in bigger cities.